Why should you implement the seven-step Priority Promise Life Management System? Quite simply, the alternative isn't very attractive. Navigating today's busy world without some type of life management system is virtually impossible. How many people do you know that excel in one area of their life, only to completely fail in another area? In my line of business, I deal with individuals who are extremely successful on a professional level. They have great business acumen and put all their energy and time into growing their net worth and building their corporate empire. They often fail, however, in managing their other roles. They may find their marriages struggling, their relationships with their children nonexistent, they fail to take care of themselves mentally or physically, and they have few close personal relationships. They focus their time and effort in one role (or a few closely related roles) with no plan or discipline to manage the other important areas of their life. The Priority Promise system literally changed my life. I wrote this book because I believe it can change your life too. We must all learn to prioritize our lives in such a way that the important roles are satisfied first and we are realistic about what we can accomplish within our available time. 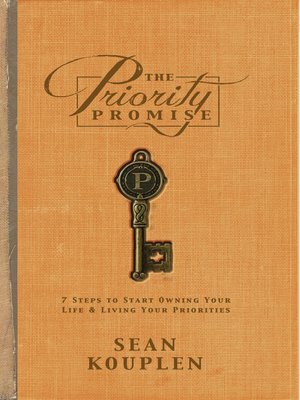 Please enjoy the book and I sincerely hope that The Priority Promise has a profound impact on your life, just like it had on mine.